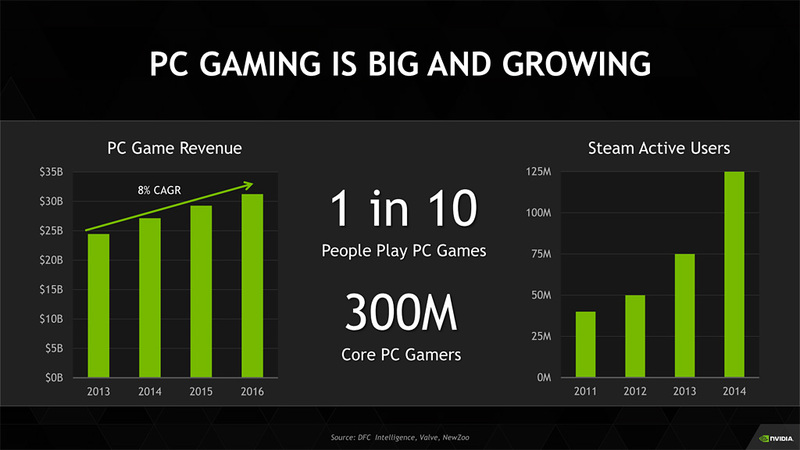 NVIDIA’s Executive Vice President, Jeff Fisher, in an interview with PCWatch showcased the growth of their discrete graphics business in the APAC market. With the launch of the Maxwell based GeForce GTX 900 line, NVIDIA has seen a tremendous growth in the discrete graphics market with new products focused towards performance and power efficiency. The news is quite big in the sense that we are talking about the entire APAC (Asia Pacific) market. 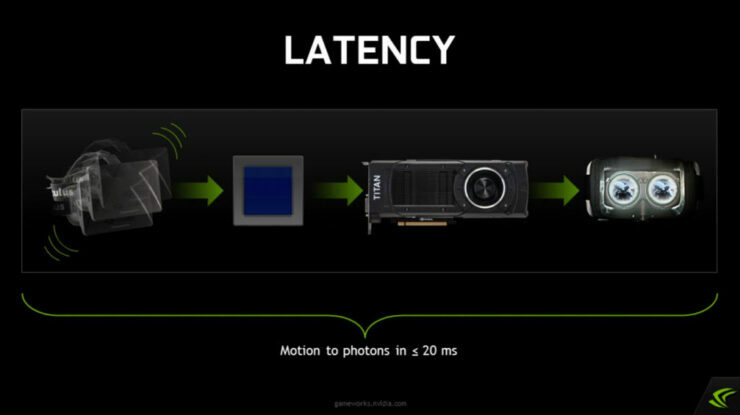 Previously, NVIDIA’s CEO, Jen-Hsun Huang had mentioned that they are already seeing users shifting to high-end GPUs. The latest news is in specific to the Japanese market which now has a 75-80% market share of GeForce cards while the remaining 20% are competitor based cards. The Maxwell based lineup with its aggressive pricing in the entry level market that begins from the GeForce GTX 950 to the high-end GeForce GTX 980 Ti that’s based on the GM200 GPU are already too competitive against the cards they are placed against. Some cards are even getting retailer specific price cuts and that drops the $499 GTX 980 down to the $479 range, the $329 GTX 970 down to the $299 range and the $199 GTX 960 down to $189 range. The reason for this high growth in the APAC market could be due to several reasons. The rise in PC gaming and Steam has led to an overall growth in the DIY market and APAC market is known as one of the biggest market in terms of DIY builders. 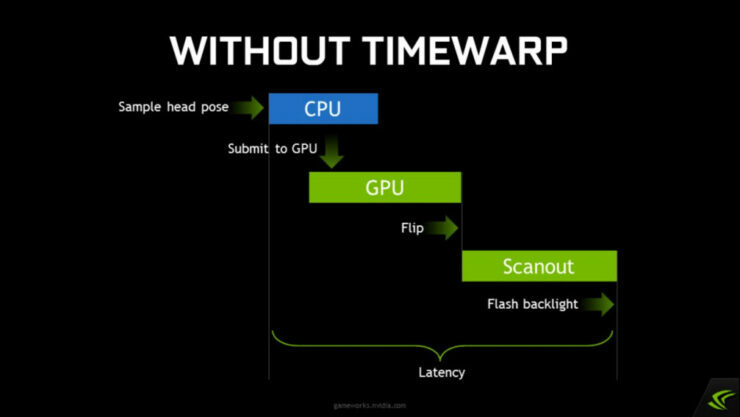 While controversial, Gameworks has without a doubt led to an increase in GeForce sales offering better graphics effects such as PhysX, FleX (Unified PhysX), Fur, etc. 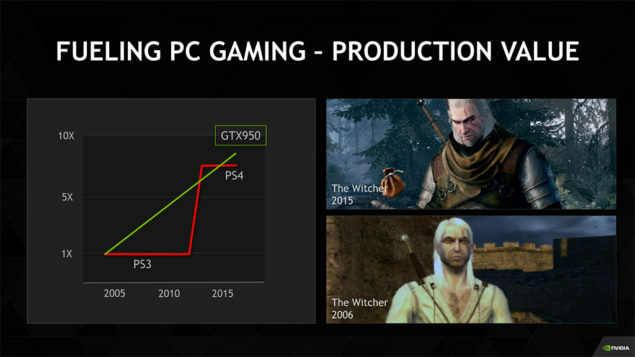 One of the slide even shows the GeForce GTX 950 having greater performance than the PS4 with the capabilities to run the AAA title at 1080P. The GeForce GTX 950 retails for $159 US (Official MSRP) and it can be seen that market where the PlayStation 4 is very dominant (e.g Sony) is shifting to GeForce GPUs. 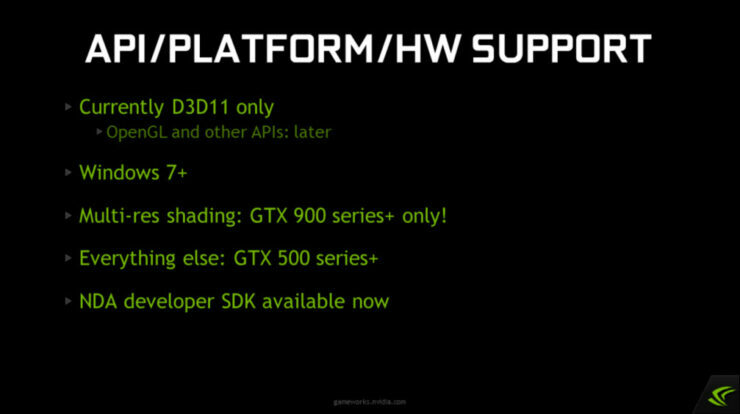 In the other slide, NVIDIA has shown off their entire GeForce GTX Lineup which is based on the Maxwell core architecture. The current lineup for 2015 includes the GeForce GTX 950, GTX 960, GTX 970, GTX 980, GTX 980 Ti. These cards are solely aimed towards gamers while the GTX TItan itself can be seen as a both professional compute and professional gaming part. It’s easy to tell why Titan X isn’t part of the GeForce GTX lineup since it has a $999 US pricing but performance closes in with the GeForce GTX 980 TI. The only reason to have one is the full GM200 architecture that can be focused on compute based workloads and 12 GB memory that can be put in to good use by developers. NVIDIA has recommended that their GeForce GTX 980 Ti and GeForce GTX 980 are focused for 1080p @ 90 FPS VR Gaming and also 60 FPS AAA gaming on 4K resolution. The GeForce GTX 980 can play at 60 FPS in AAA titles up to a resolution of 2560×1440 which is also true for the GTX 970. 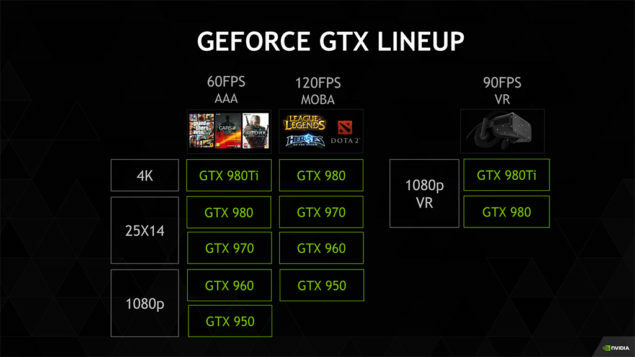 The GeForce GTX 960 and GTX 950 are focused towards 1080p @60 FPS gaming. NVIDIA also focuses towards 120 FPS MOBA gaming which has risen over the past few years tremendously. 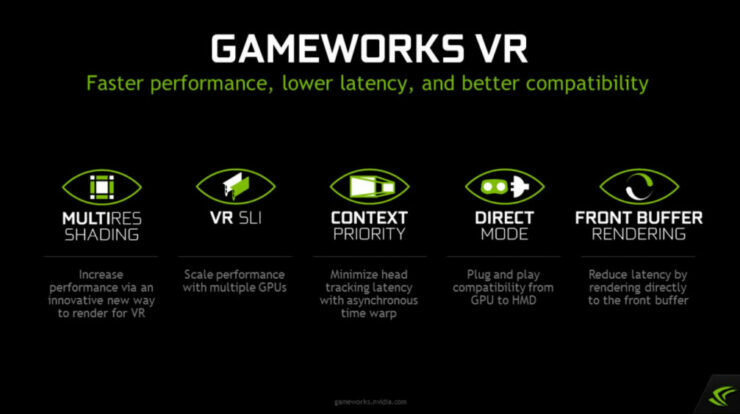 NVIDIA has a huge focus towards VR Gaming with their “Gameworks VR” initiative that focuses to reduce latency, and accelerate stereo rendering performance. 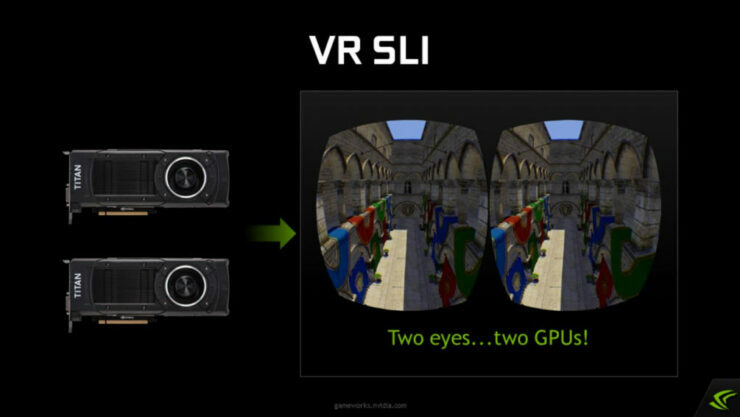 With the new VR tech, NVIDIA also introduces VR SLI which allows frames for each eye to be rendered on one GPU. A better way to use two GPUs for VR rendering is to split the work of drawing a single frame across them. 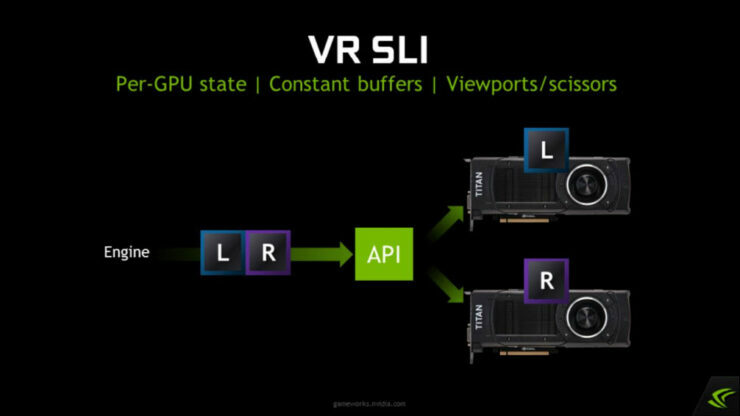 VR SLI is really an API for explicit control of multiple GPUs. It gives you the ability to distribute the workload however you want, over as many GPUs as you have. However, that also means it’s up to the app to decide how to use the GPUs. 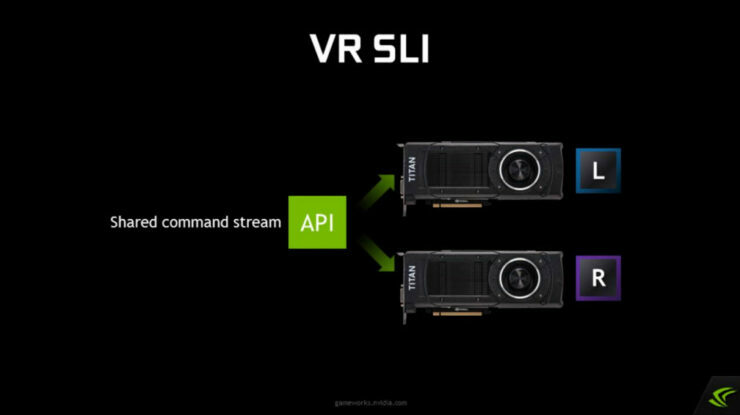 VR SLI doesn’t work automatically, or even mostly automatically, like AFR SLI — it requires work on the engine side to integrate it. Moreover, performance scaling is going to depend on the app. One potential scaling issue is work that gets duplicated on both GPUs. For example, both GPUs will need to render the shadow maps for the scene. That’s technically a bit inefficient, because the two GPUs will be repeating the same work, generating exactly the same shadow maps. GPU particle systems and GPU physics sims are another couple of cases where you’ll probably end up repeating the same work on both GPUs. The scaling we see will depend on what proportion of the frame is taken up by this kind of duplicated work. If there’s very little duplicated work, you’ll get close to 2x scaling, but if there’s a lot you’ll get lower scaling. 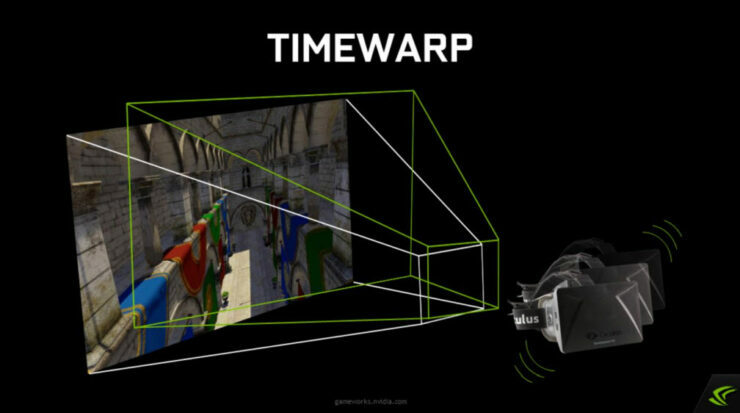 Regarding Preemption Context Switching, NVIDIA uses a feature called TimeWrap in the Oculus SDK to render an image and then perform a post process on that rendered image to adjust it for changes in head motion during rendering. 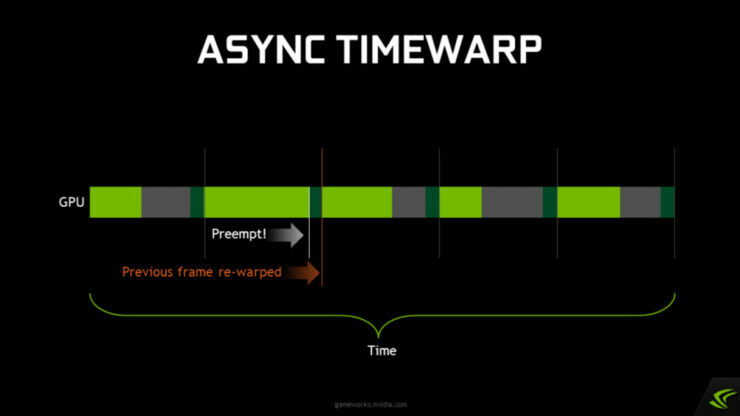 With Async TimeWrap, NVIDIA can make timewarp not have to wait for the app to finish rendering. 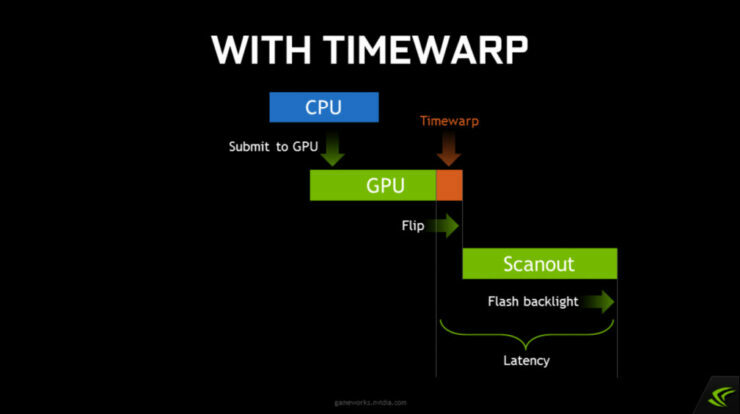 Timewarp should behave like a separate process running on the GPU, which wakes up and does its thing right before vsync, every vsync, regardless of whether the app has finished rendering or not. 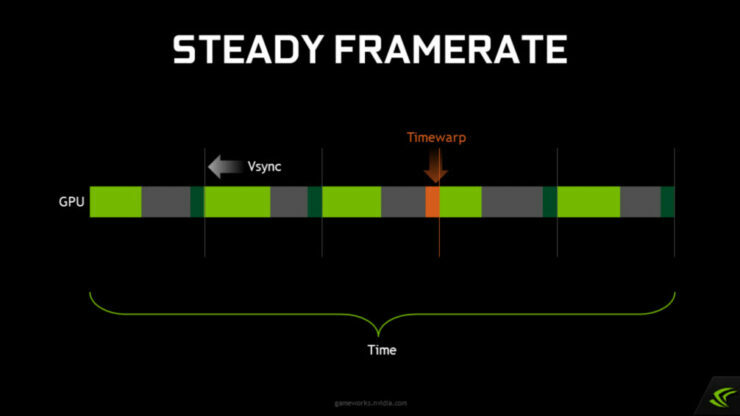 NVIDIA is enabling VR platform vendors to implement Async timewrap by exposing support in our driver for a feature called a high-priority graphics context. It’s a separate graphics context that takes over the entire GPU whenever work is submitted to it – pre-empting any other rendering that may already be taking place. 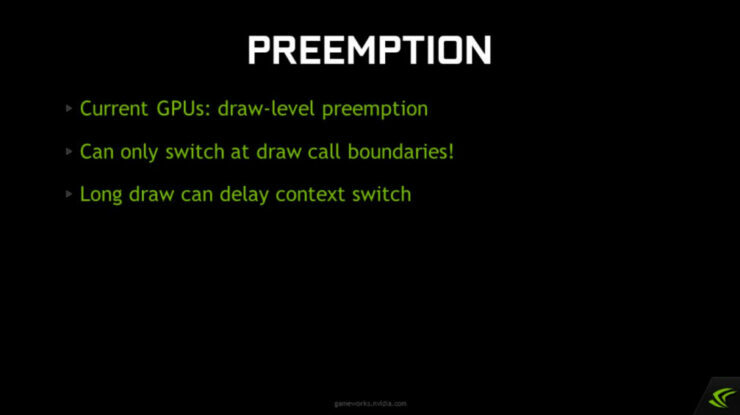 A recent report has suggested that Preemption Context Switching is by far best on AMD GPUs, good on Intel Gen9 chips and potentialy catastrophic on NVIDIA’s GPUs. It could be possible that AMD hasn’t yet enable support through the drivers since recent AOTS benchmark also showed NVIDIA having lower gains in DX12 compared to AMD GPUs. 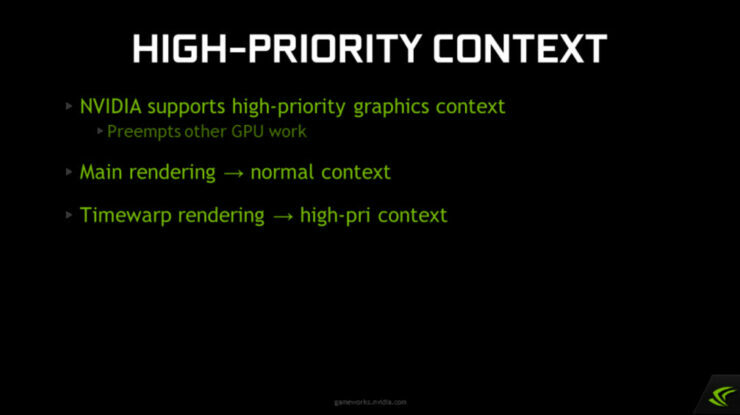 NVIDIA recently commented on the news and said that they’ll be fully implementing Async shaders support through drivers. 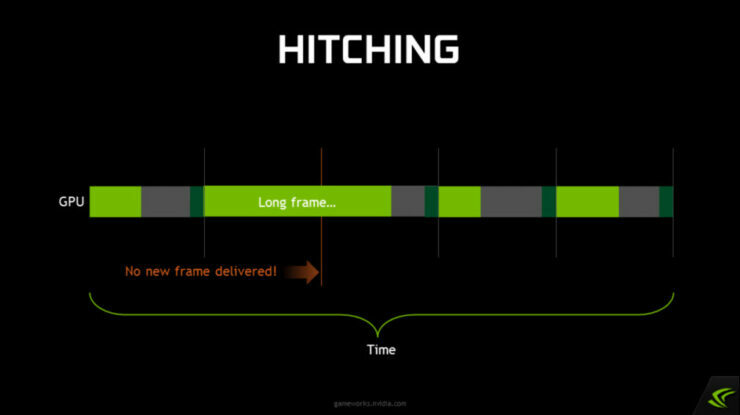 Once NVIDIA features Async support through drivers, it will be possible to see better DX12 performance and Preemption Context Switching on NVIDIA hardware.